I own this gun already and it is a great carry conceal weapon. Small, lightweight and being a female I like how slim it is to tuck in my waistband (I added a Desanti clip grip). Now I am buying one for my son who carried mine one day and fell in love. Price and value. Prizes for practical shooting orginazation. Reviews and S&W lifetime warranty. No lock , simple and utterly reliable. In addition to the S&W reliability it’s an excellent choice for a back up / hideout. I really like these J-frame revolvers as a nice backup pistol. They are really light and easy to conceal. It's within my department's policy as a backup gun. I would prefer the stainless finish, but this one didn't have the internal lock. S&W 442 is my choice for its light weight and concealable size. Always wanted to have at least one revolver. Off duty carry for work. I chose this version of the S&W revolver since it doesn't have the internal lock. Is this item factory new or used? BEST ANSWER: Yes these guns are new. I have bought two of them and they are excellent. Brand new! Shoots great right out of the box. Love the simplicity and size. Perfect CC gun! This is a perfect little carry gun and it has no lock. Great price, fast delivery, can't get any better than that. I will be doing more business in the future for sure. Grab a gun price under $350 is decent I think. Most places $400 or more. From the factory the finish wasn’t great. Soon to have pocket wear so no biggie. 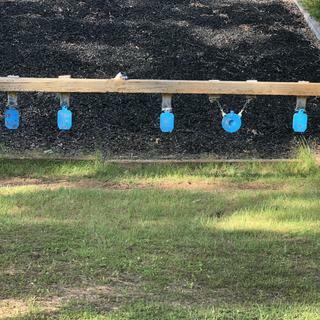 Fired a few hundred rounds at the range, will do the job. Ejector rod was bent and would not clear empties. At the factory now for repair. Great quality firearm. Simple and works. Good experience with grabagun. Most reliable pocket gun you can buy. I was first introduced to the 442 by a gun safety instructor. 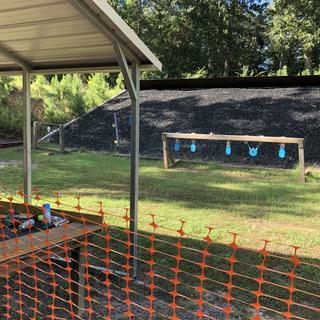 I had been shooting at the range that day and my Ruger .380 kept jamming and I was concerned about what would happen if I was in a self-defense situation and it jammed. He brought out his 442 and let me check it out and I bought one right away. 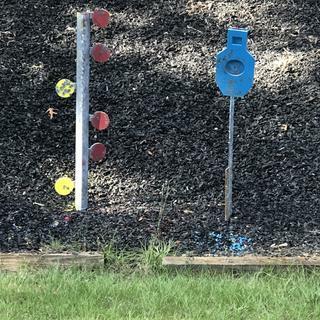 It didn't disappoint at the range the next day at all. Powerful, reliable, fits like a glove, yet small enough to conceal. This is my new EDC and I love it! Great product as always from Smith & Wesson. This is my first order from Grabagun.com but won’t be my last. Fast shipping and great prices. Cheaper than Bud’s, plus the price you see is the price you pay. No “cash discount” (that isn’t really a discount), no waiting 7-10 days for your order to ship. I’ll definitely be a return customer. I bought this gun for my wife. The only thing she didn't like was the small grip. I added the purple, her favorite color, Houge grip and she loves it! Great gun for concealing, light weight and fits in the waist or in a pocket, finish is nice, have not had long enough to judge any wear issues. Excellent CCW gun, absolutely reliable! Great service from GAG! It is the best Revolver for pocket carry. No lock, so no worries about the lock accidentally jiggling and locking the gun. It is plus P rated. Shoots to point of aim. It did well with 125 standard pressure and plus P ammunition. I pocket carry the gun and a speed strip. A gun to hand down to your children. My firearm was ready for pickup within two days at the Coppell location. The staff as always were helpful and friendly. This is not my first purchase from Grab A Gun. I bought my 442 as a gunsmithing project and because I wanted to try a revolver. Out of the box it was well made and quite accurate. However after a full internal trigger job including new Wolff springs and several hundred fired rounds and a lot of dry firing it became outstanding. Long but very smooth trigger action that I can pull with my little finger. I had always heard that a J frame conceals better in a pocket than a semi-automatic but never believed it until now. With a soft pocket holster it looks like a clump in a pocket without any angular lines to print. My 442 is a fun retro gun to shoot and a valuable self defense tool. It was a fun and rewarding gunsmithing project. It is extremely reliable and simple to operate. I like it. I absolutely recommend this, and all the other lightweight Smiths. Dealing with Grabagun has been a great experience and am lookiing forward to doing business with them again. I would recommend this gun to anyone. Was very inexpensive. Carries well and dealing with grab a gun was as easy as it comes. Fantastic little j frame for the price. I bought this gun as an everyday concealed carry. I have to say though i have never owned a revolver. Getting used to staging the trigger and overall learning the gun took a bit of time. However, after firing over two thousand rounds through it, i’m now just as accurate as with my full size M&P 40. I have nothing to complain about this gun whatsoever. There wasn’t a single problem or issue since i purchased it. 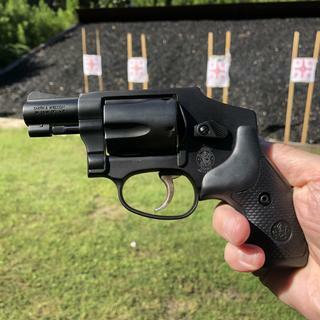 If anything, this single 442 opened my mind to how great revolvers are and will definitely be buying more in the future! The whole package is well designed and works well. I am very happy with it and feel comfortable handling. It is a size that will conceal easily too. The no hammer is a plus in this situation, and makes it a very straight forward operation in an emergency setting. I don't see any thing better out there. Grab a Gun has the best price online. The delivery was quick. The placing of the order was easy. Quality of the firearm is outstanding. 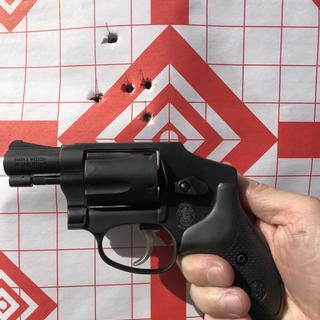 I am happy with my S&W Model 442 38 special. Tried and True S&W Revolver. Excellent revolver. I put a LaserMax light on it and makes it a great self defense gun. Great gun for edc. Just not easy to shoot and only have 5 rounds. It's a classic J frame belly gun. I have three more J's and this one is the best. The light weight makes it almost unnoticeable in a pocket all day long. If you are going to eat, you might need more gun, but if not, certainly consider this. Still getting used to double action only, but like the gun a lot. 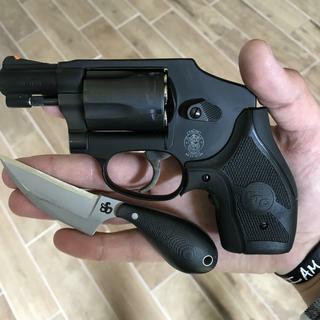 Awesome revolver, even better price. Fast shipping from GaG and a great price.This is a fantastic CC revolver, light weight and very easy to. Very nice quality. Shoots well. Mine loved 110 Gr Hornady Crirical Defense. I went from several single stack 9mm to this just because for my body type and carry preferences it works the best for me. Excellent revolver at an excellent price + S&W Rebate = Happy Buyer : ) I bought this as my "Take the dog out (Black German Shepherd) when it's dark"... we live in the country with wild critters like Coyotes always around and some bold ones coming right up to our house (shot at one running away with my long barreled Judge with PDX1 ammo and hit it, but not with enough power at the long distance [approx 100-125 ft.] to stop it), so now I have a long barrel 12 gauge pump with Coyote thumpin' loads for when I have time to grab it and react, but need a reliable lightweight pocket gun with power when just taking the dog out to do her business. I put a cool light on the 442 (made just for J-frames) that lights up the close area in case of a distempered coyote or stray dog. The "Airweight" 442 fits just about any pocket without bogging down yet provides a powerful deterrent with basic 38 SPL ammo. I also have the first 2 cylinders loaded with "BIG 4" 38 SPL/357 MAG Shotshells... kinda like a mini-Judge. It's protection for ME, not the dog. She's vaccinated for Distemper and would tear up a coyote or 2 if they actually were sick enough or stupid enough to attack, BUT she's trained well enough to stay by me to give me enough time to stop the threat. I own a number of handguns, but this is one that I will never part with. This carries so easily in a pocket. A nice leather pocket holster keeps it in the exact position. The action was a little heavy, but that is easily fixed. Grabagun great site and quick service. S&W always have great guns. This model 442 has been around a long time. Slips easily into my pocket for CCW. Grabagun easy to order and fast service with constant tracking. Great experience again with GAG. I could only give a 4 for quality as my wife won't let me shoot it.value5, well happy wife happy life. Same old J frame, tight, shoots well, unbeatable price. Best price and shipping I found online, guality gun, its a smith! Great gun at a great cost. Small size Big Bang!Feels solid in your hand . Everything works as a Smith and Wesson should. Another quality product. Best price right here at grabagun.com. Fast shipping great service! ALL BACKED BY SMITH & WESSON'S LIFETIME SERVICE POLICY.